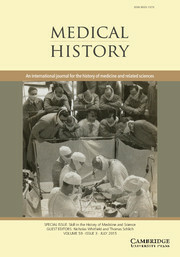 The latest issue of Medical History, dedicated to Skill in the History of Medicine and Science, contains at least one article that interests the readers of h-madness. Adolf Meyer (1866–1950) exercised considerable influence over the development of Anglo-American psychiatry during the first half of the twentieth century. The concepts and techniques he implemented at his prominent Phipps Psychiatric Clinic at Johns Hopkins remain important to psychiatric practice and neuro-scientific research today. In the 1890s, Meyer revised scientific medicine’s traditional notion of clinical skill to serve what he called the ‘New Psychiatry’, a clinical discipline that embodied social and scientific ideals shared with other ‘new’ progressive reform movements in the United States. This revision conformed to his concept of psychobiology – his biological theory of mind and mental disorders – and accorded with his definition of scientific medicine as a unity of clinical–pathological methods and therapeutics. Combining insights from evolutionary biology, neuron theory and American pragmatist philosophy, Meyer concluded that subjective experience and social behaviour were functions of human biology. In addition to the time-honoured techniques devised to exploit the material data of the diseased body – observing and recording in the clinic, dissecting in the morgue and conducting histological experiments in the laboratory – he insisted that psychiatrists must also be skilled at wielding social interaction and interpersonal relationships as investigative and therapeutic tools in order to conceptualise, collect, analyse and apply the ephemeral data of ‘social adaptation’. An examination of his clinical practices and teaching at Johns Hopkins between 1913 and 1917 shows how particular historical and intellectual contexts shaped Meyer’s conceptualisation of social behaviour as a biological function and, subsequently, his new vision of clinical skill for twentieth-century psychiatry.